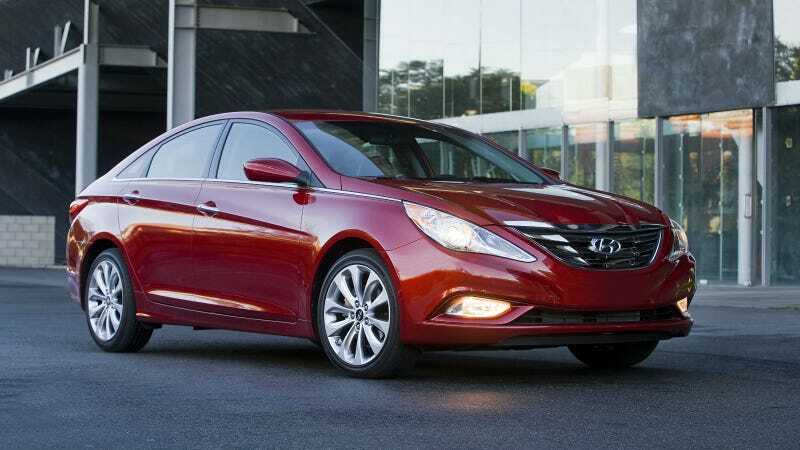 The Detroit News reports that Hyundai has issued a massive recall of its Sonata sedan for two separate issues. The first recall, which affects 883,000 vehicles involves the car rolling away; the other recall affecting 5,650 cars involves defective front brakes. Thankfully, no cars have both problems. The automaker notified the National Highway Traffic Safety Administration that it will be recalling 883k, 2011-14 Sonatas built from December 2009 through May because the shift cable can become disconnected. The shift cable prevents the vehicle from being shifted out of park, if disconnected the car can roll away. Hyundai has already received 1,171 warranty claims regarding the issue. Dealerships will inspect the cable, and replace, if needed, free of charge. Hyundai is also recalling 5,650 of the brand new 2015 Sonata because one or more of the front brake calipers may crack. The automaker was notified of this problem on June 13th when a dealer reported that a customer stated the brake pedal "went to the floor at stops." The dealership investigated and found the front caliper had fractured. Hyundai is issuing a stop-sale on any 2015 Sonatas still on dealership lots. Owners of 2015 Sonatas are advised to stop driving their vehicles. Hyundai will replace the affected brake calipers free of charge.